Intel has announced its processors are moving towards being lead-free. As we reported yesterday, green issues are becoming more important even for large tech industry players. Corporations are seeking to avoid adverse publicity from the glare of pro-green organisations. Intel says the move, due to be introduced in its next-gen 45-nanometer process-based chips, is part of its "broad commitment to environmental sustainability". Here, the company explains why now is the time for lead-free processors, how going lead-free will actually happen and what else the company is doing to boost its environmental record. The first lead-free processors are known as the Intel 45nm Hi-k family and include the next-generation Core 2 Duo, Core 2 Quad and Xeon. The company will begin 45nm Hi-k production in the second half of this year. For many decades lead has been used in electronics because of its electrical and mechanical properties. This has made the search for replacement materials that meet performance and reliability requirements a significant scientific and technical challenge. In 2002, Intel produced its first lead-free flash memory products. In 2004, the company began shipping products with 95 per cent less lead than previous microprocessor and chipset packages. To replace the remaining five per cent (about .02 grams) of lead solder historically found in the first-level interconnect - the solder joint that connects the silicon die to the package substrate - in processor packages, Intel will use a tin/silver/copper alloy. It is the way in which the company will implement these new materials to replace the tin/lead solder that is the "secret sauce" of the company's solution. Intel's advanced silicon technologies have a complex interconnect structure. A great deal of engineering work was required to remove the remaining lead in Intel's processor packages and integrate a new solder alloy system. Intel engineers developed the assembly manufacturing processes involving the new solder alloys. They were able to accomplish this, retaining the goals of performance, quality and reliability. While no multinational has quite attained a full environmental halo, Intel says it is now thinking of energy efficiency in everything it does. 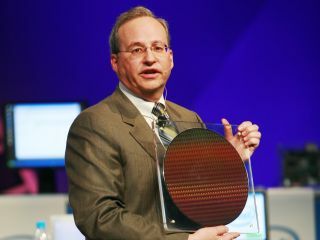 Whether in regard to the smallest 45nm transistors in its forthcoming lead-free processors, and today's high-performance Intel Core 2 Duo processors that consume up to 40 per cent less energy, or to broad support for industry standards and strong public policies. In 1996, the company led an industry-wide agreement to reduce global warming gas emissions in semiconductor manufacturing. Today it is working with the European Union to discuss how the technology sector can help meet the EU's target of cutting greenhouse gas emissions by 20 per cent by 2020. The company says it is focused on reducing the natural resource use and waste by products of its manufacturing process. In the past three years, the company has saved more than nine billion gallons of fresh water through conservation measures - though doesn't say how many it still uses. And it reckons it has reduced its global warming gas emissions by the equivalent of removing 50,000 cars from the road. Intel says it has reduced hazardous materials in its products and recycles more than 70 per cent of its chemical and solid wastes. It also says it is increasingly moving towards renewable energy. Intel is the single-largest purchaser of wind power in Oregon and the largest industrial consumer of renewable energy in New Mexico. Through the company's ongoing conversion from 200mm to 300mm wafers, it has been able to reduce water consumption by approximately 40 per cent for each square centimetre of silicon produced. Earlier this year Intel transitioned its Intel StrataFlash Cellular Memory packages to halogen-free technology. The company is currently evaluating the use of halogen-free flame retardants in its CPU package technologies.